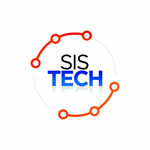 Whilst it has been a damp week at SIS, the activities and sprits of the staff and students have not been affected! Thank you for your attendance at the Parent-Teacher conferences last week; it was a very positive day. The interaction allowed parents of secondary students to spend time with teachers, to find out about areas of difficulty and discuss how to address these. Please remember to use the online digital platforms available to address issues. There were a few staff who were unable to make the event, so please do have follow up discussions with these teachers through email or phone. Last weekend our primary teachers came into school on Saturday to complete day 2 of an iPad course, focusing on the effective use of iPads in primary classrooms. They worked with Carmelo Sanchez, Hiria Gutierrez and Jose Vicente, who is in charge of Apple Education in Spain. I would like to publicly acknowledge their dedication and commitment to enhancing their learning. Thank you to those parents who attended the two Managebac sessions for primary parents this week. Learning about this platform early is critical to mainlining our 3-way partnership between students, teachers and parents. Managebac is our platform for reporting in primary and for giving regular feedback on assessment tasks as well as reporting in secondary. This week on my walk around I popped into some wonderful service learning projects in Science between M2 and primary students. The foci of the projects have differed between year groups, however it is a wonderful initiative to allow older students to connect with younger students around educational issues. For more details, please see the report in secondary section news. This week I also began a discussion session with students from different year groups. On Thursday I met with M2 and D1 students to listen to their thoughts on the school, areas of delight and areas for improvement. We wish our Under 19 boys football team the best of luck as they head off as reigning champions for the Algarve cup! The weather does not look good for them, however their recent practices in rain, drizzle and mud have prepared them perfectly for this event! 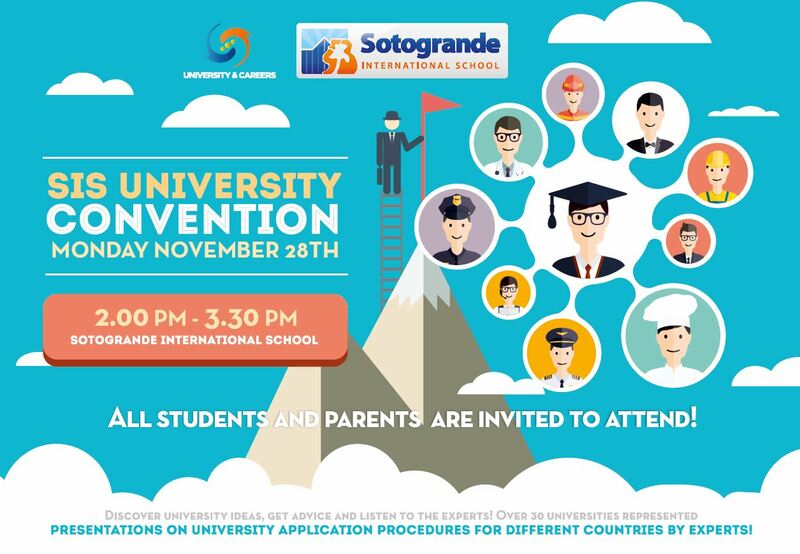 This Monday coming, the 28th we host our annual University Convention. Higher Education providers from across Europe and the USA will be attending to give advice, share experiences and allow face to face interaction for our students, with insights into the application process and how to prepare. Parents of M3 and above are invited to attend with their children from 2pm till 3.30pm. Please note that the Universities will depart at 3.30pm. I wish you a wonderful weekend and wish to forewarn you of the long weekend on 5th and 6th of December. Please note that Thursday 8th will be a normal school day. Following several incidents where children with nut allergies have come in contact with nuts that have been brought into school, we are now introducing a No Nuts policy across the whole school. A nut allergy can result in life threatening symptoms. We have an increased number of students with severe nut allergies in school this year, including those who are allergic to airborne nut oils and those who have symptoms when they come into contact with surfaces that have previously been touched by others who have eaten nuts. It is the responsibility of the whole school community to ensure that all children are safe whilst at school, therefore we ask you not to give your children nuts or nut products such as Nutella, peanut butter or biscuits with nuts to bring into school. We understand that nuts are an important part of a healthy diet and they can be eaten outside of school. Particular flashpoints are celebrations such as birthdays, Christmas or school functions when food is brought into school by students and parents. Please be aware of students with food allergies at these times. Join the Parent Ambassador programme! First session on December 1st. At SIS we are very lucky to be able to offer our teachers many courses that support their professional development and development of our Primary School. At the start of this week Lisa Reynolds spent three days in the UK completing a Kagan course on cooperative learning. Cooperative learning offers a powerful alternative for language teaching -interaction! Kagan structures are instructional strategies designed to promote cooperation and communication in the classroom, boost students’ confidence and retain their interest in classroom interaction. This is the third course Lisa has completed and she will now be able to apply to become a Kagan Instructor for our school. This weekend we will also see many Primary Teachers and Teaching Assistants spending their Friday evening and whole day on Saturday in school participating in an Apple run iPad course. This will be the third weekend out of four that these members of staff have committed their own time to developing their skills to use technology to enhance the learning of our students. I would like to thank them all for their professionalism and dedication. Primary Student Council and Primary Student AmbassadorsThis week these students were proud to receive their official badges. Well done to all. Over the last two weeks many of our Primary students have enjoyed learning from our secondary students. This week it was P5’s turn. M2 students all rose to the challenge of designing an activity that would help teach the P5 students about the importance of eating a balanced diet. P5 enjoyed a great morning and learnt a great deal through the many different M2 student designed activities. Last Friday night Miss Eliza, Miss Eva, Miss Anne, Miss Jane, Jaime, Jess from the Kindred Project and myself spent the night with over seventy P4-P6 students on the KP organised sleepover. During the evening secondary Kindred Project students organised a variety of games, activities and the barbecue dinner. Everyone had great fun and all the money raised is going to the Kindred Project Ecuador project. Last week P5 and P6 enjoyed exploring and using their new outdoor recreational area. They are hoping that the recent rains don’t last too long so that they can use this space again soon. Primary Students reflection on the recent Kindred Project Family Trip to AsniLast week Alba (P4), Rafa (P6) and Jago (P6) presented to the whole of Primary about their experience on the Asni Family Trip over half term! It was fantastic for them to share their wonderful educational experience with their peers. This Christmas, the Student Council has come up with a new and unique idea. This project will put smiles on people’s faces! The Primary Student Council has decided to initiate a ‘Giving Advent Calendar’ whereby students can give food instead of receiving an advent chocolate. Where the idea came from… Around the world, most schools have an advent calendar. It is a rectangular cardboard with dates and flaps. Inside each flap is a chocolate that a person gets to eat. We decided to take this idea but reverse it. Instead of taking a chocolate we are asking students to give food to Hogar Betania. The food brought into school should be something that will last for very long e.g. rice, tomato purees, vermicelli, flour, sugar, olive oil etc. How it will work… Each classroom will have a blank calendar. From the first of December two students can write their names and what type type of food they will bring. By the end of this project our aim is for each class to have a hamper full of food that we will deliver in person to Hogar Betania. For their science service learning our M2 students did some peer teaching of the primary students. They taught P2 about electricity, P3 about the states of matter, P4 about materials and P5 about food and diet. M3 LOMCE students invite their parents to an exhibition of their work related to their unit on population focusing on refugees. This will take place in P23 from 9.30 am on Tuesday 29th November. It is that time of year again when the council would like to begin our tradition of the box appeal. Last year boxes were filled with toys and small gifts, however this year we want to make a difference to a whole family and therefore we will be creating Christmas food gift boxes. 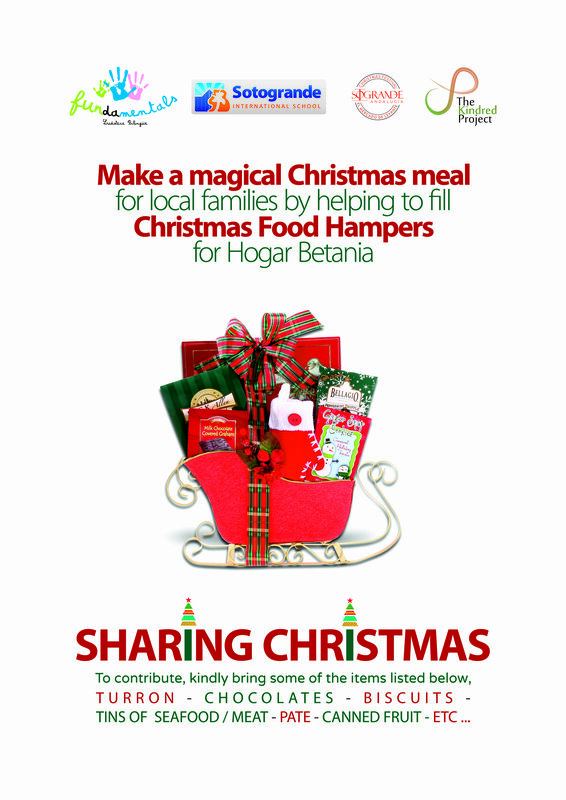 The idea is that each advisory group will fill 1 or more boxes with traditional Christmas goodies for Hogar Betania. This will be like a Christmas gift for the 130 families that currently benefit from Hogar Betania’s Soup Kitchen Programme. The boxes can be filled with items like turrón, assorted chocolates, biscuits, nuts, canned fruit, etc. Generally, Christmas products that don’t go off too quickly. We will then deliver all the boxes to Hogar Betania in time for Christmas! There will be a prize for the advisory group who donates the most. The appeal has been launched and the deadline is Monday 12th December, so please get involved as it is for a great cause! As part of our SIS commitment to personalised learning and empowering students to be the best that they can be, the English Language Development (ELD) programme supports the learning of students who do not have English as a first language, both throughout their learning journey at the school and beyond into higher education. With this aim in mind, our M4-D1 ELD students sat the first internal IELTS test of the academic year last week, to track and monitor their progress towards their long-term targets in higher education. Interpreting these results allows us to set individual targets for improvement and implement specific support strategies in the short and long term. This has been a busy week with two sessions for University & Career preparation for M4 and M5, a Skype session with Loyola Marymount University for interested students and an excellent TOK driven presentation for D1 by Prof. Matthias Hühn from the University of Navarra, all on Monday & Tuesday. Then on Thursday morning we had a fascinating presentation on EUC Erasmus college by former SIS Student Nienke Ernstsen Schmidt, who is now a First Ambassador for EUC https://www.eur.nl/euc/ The focus was a real insight into the interdisciplinary academic core in the first year, and moving on to the different aspects of the second and third years at Erasmus. Thank-you, Nienke. Parents are invited to attend from 2 -3.30pm. The next scheduled NADFAS lecture on Wednesday 14th December by Lynne Gibson will be on ‘How to look at Art’, not as advertised last week ‘Symbols and Emblems in Dutch Genre Painting’. 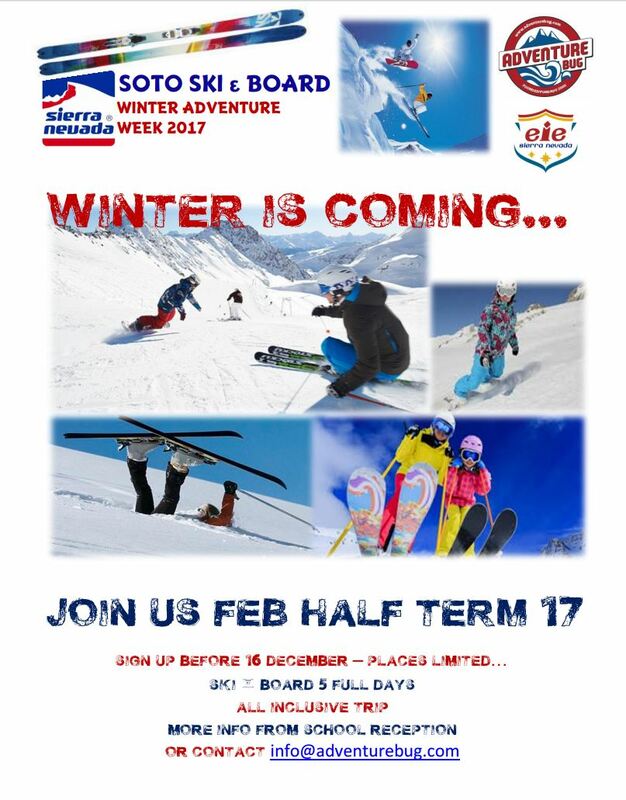 See next week’s newsletter for more details. Our SILA students in their second year of Russian classes confirm that with enthusiasm, perseverance, work and motivation, learning a foreign language is an enjoyable journey with good results, especially when in combination with good methods and great teachers. 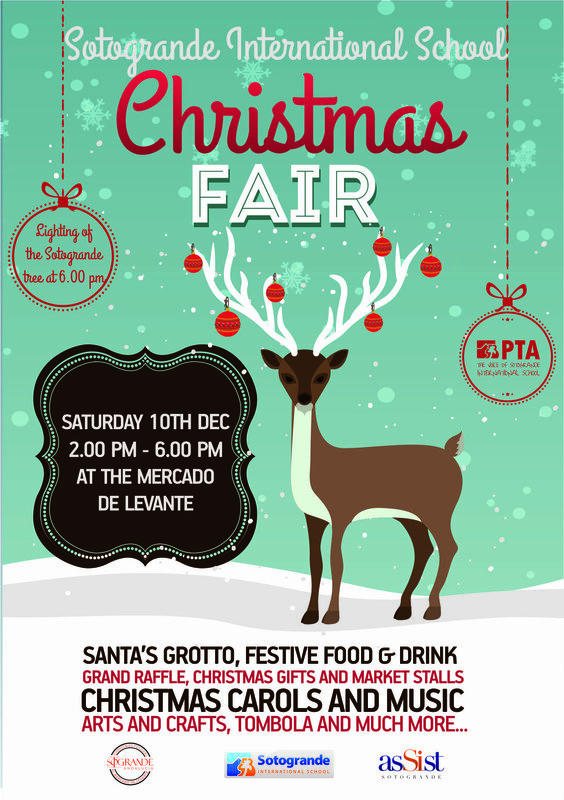 The Christmas Fair will be held on Saturday 10th December from 2-6pm at the Mercado de Levante. There will be the traditional market stalls, festive food and drink, tombola, Santa’s grotto and children’s activities, as well as Christmas carols and music. We will also have a grand Christmas Raffle, with some amazing prizes including a fabulous night in a Superyacht Junior Suite plus dinner in the Sky Restaurant courtesy of the Sunborn Gibraltar! Raffle tickets will be sent home next week with every student, so please look out for them. Our fair will conclude with the lighting of the Sotogrande Christmas tree at 6pm, a great way to end what promises to be a wonderful community event. What do you think of your PTA? We would like your feedback! Please take a few minutes to complete this survey. During last Friday evening, the D1 Kindred Project students with the help of staff members, Miss Eliza Cherry and Mrs. Emma Butler, organised and ran a sleepover for P4-P6 students; raising €1,390 for The Kindred Project which will go directly to support and sustain the Eco Tourism project and the cultural centre, run by the Tsa´chila community in Santo Domingo, Ecuador! Thank you to everyone on the night who helped to organise such a fantastic event and to the SIS community for your continual support towards The Kindred Project and our partners. The Kindred Project travelled to beautiful Switzerland to promote student leadership and education as a force for good! Our student ambassadors, Bella Sträuli & Vittoria Morace (D2) and alumni Chloe Lawrence, presented at the Conference for Primary Student Councils at the International School of Geneva and visited the International School of Central Switzerland (ISOCS) to spread their message about how KP and SIS have supported them to turn their ideas into reality in order to support good causes. The girls also met with ISOCS current D1’s, shared their advice on the IB, talked about CAS, SotoRox and their volunteering and intercultural exchange trip to Asni. Amazing job girls, we feel very proud of you! To see the photos, go to The Kindred Project Facebook!